Gonzo’s quest is the latest and seemingly greatest online video slot from brilliant developers Net Entertainment, utilising their brilliant Avalanche reels. This 20-payline, 5-reel Aztec themed video slot comes with a host of bonus rounds, features and boasts a top prize of a whopping 62,500 coins. The game focuses around the historical character, Gonzo Pizzaro, who is a famous conquistador who thrived in the 1,500’s and his quest for Eldorado. As a result, Net Ent have shaped the slot around this search for gold, boasting medieval styling with a host brilliant Gonzo quotes throughout. This boldly named slot definitely warrants a double take at first glances, boasting some really cool yet crazy designs and animations. The team at NetEnt have certainly made sure that they have released this game with only the highest quality features and this can be seen from the off. The authentic looking design accompanies the awesome animations that are in action before you even take a spin, and when you spin a win also. 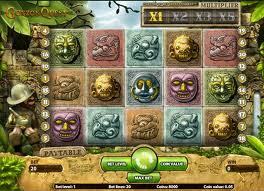 The theme for the symbols can best be described as ancient Mayan. Although there is no real name for any of the symbols, they look much like something you would find in a lost South American tribal city. So players can expect to see plenty of unusual looking masks, all of which are colour coded, making the distinctions between each much easier to spot. As previously mentioned Gonzo’s Quest incorporates Net Ent’s patented avalanche reels. This great feature is triggered every time a winning line is hit and allows symbols from above to tumble down into their respective slots. This is a great way to start a sequence of wins, from the smallest of lines! A cool addition to this neat feature is that the multiplier ladder will increase after every avalanche, making it double, treble or even five times as lucrative. Gonzo’s quest has a brilliant free spins round to get stuck into, triggered by spinning 3 ‘free fall’ icons anywhere on the reels. Once triggered players will be treated to 10 free spins for every line that utilised the ‘free fall’ logo! As a result, there can is a possibility of triggering much more than you bargained for here. Whilst the free spins are playing out before your eyes, there is also the chance to multiply all final winning by as much as x15, so make sure you keep an eye on that multiplier meter. Gonzo’s quest takes a different approach to playing online video slots, most notably using a totally new way of spinning reels. The high amount of coins that can be bet per line makes it a true high roller in Net Ent’s array of games, and there is plenty of action during the standard game thanks to the awesome avalanche feature. Gonzo’s quest is available to play at every best casino’s that are backed by Net entertainment.